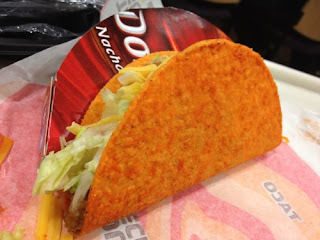 Hungry Jerks - Food Recipes and Restaurant Reviews: The Dorito Locos Taco. Taco Bells McRib?! Once in a blue moon, a fast food place comes up with something so insanely genius, it becomes legendary. And now.... The Dorito Locos Taco from Taco Bell. This taco is so legendary, that it could be the McRib for Taco Bell. The one thing so good, that if it ever goes away fans will begin to protest and riot. It is an instant cult hit. I learned of this new taco not by a commercial, but because the local news here had a story on it! That is how important this taco is. It's a very basic, and simple concept that I am surprised it hasn't happened sooner. Basically the taco shell, is coated with the nacho cheese powder used on nacho cheese doritos. Thats it. But the results are amazing. And if you are worried about getting that powder all over your fingers, fear not, it comes with a handy little sleeve to hold it with! This is Taco Bells finest moment. My hats off to you Taco Bell. Cheese powder matters that much?